Catch Man by Tim Chen is an exciting line drawing game that offers an original concept to the traditional line drawing genre. Users will draw lines across the iPhone or iPod touch screen to save the lives of falling creatures. So how to play? 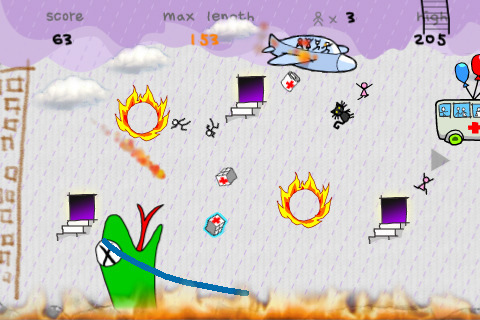 Draw on the screen with your finger and catch people, cats, and dogs that are falling from the sky. Save their lives so they can move toward the right side of the screen. Saving one person will increase the drawing length by 2 pixels. When you save a bonus item from the airplanes, the max drawing length will increase by 30, 40, or 50 pixels for 20 seconds. The game is challenging, and the goal is to save as many people as possible. If you can manage to save 20 people in the game, then you’ve done well. You can submit your high scores to Facebook and challenge friends. Scores can also be submitted to online global leaderboards. There are also some tips you should remember in order to gain higher scores. If you draw a diagonal line starting from the upper-lefthand side to the lower-righthand side, the people will bounce faster to the right side. This way, fewer lines will need to be drawn to save people and you will last longer in the game. Secondly, it is best to save someone who is falling in a higher position and save someone in a lower position later. Another key to surviving is to focus on the people rather than the bonus items the planes drop when they fly past. And under no circumstances should you draw lines on airplanes because they will crash and you will have many people to rescue. To play Catch Man , you will need an iPhone or iPod Touch with an OS 2.2.1 or higher to play. Check out the Catch Man forum at www.ifunplay.com/forums to see discussion on tips, skills, and tricks; report bugs; submit feedback or suggestions; and learn about announcements, releases, and updates. This app offers a great gameplay experience. It has catchy looking graphics and funny sound effects. The physics in the game are also good and the controls are spot-on. I also appreciate the placement of the pause button which does not hinder play and is easy to access. The game offers great finger exercise to the beginner, casual, and advanced players and allows players to work on improving their dexterity. It also provides good exercise for the brain. Chen has been welcoming feedback and incorporating changes with updates for the game which is nice to see. The addition of different monsters was a great touch. Kudos to Chen! Catch Man starts off slow and becomes frantic. It is highly addictive and the online leaderboards help addict the player to this game. The different backgrounds Chen has added are a fantastic addition to the game. I would like to see even more backgrounds, characters, collectible items, and enemies if possible. I would also like to see more challenges that crop up in addition to the monsters, doorways, and fireballs. Perhaps there could be a complementary challenge with snow and ice storms? Or a secret game that unlocks at the beginning if you shake the iPhone or iPod Touch? The secret game could be an alternate version with snow and ice instead of fire. Overall, Catch Man provides oodles of fun for a doodle graphics game. You’ll be glad you dropped $0.99 for this wonderful buy especially with all the updates Chen makes to the game. AppSafari review of Catch Man was written by Linda Ta on April 6th, 2010 and categorized under App Store, Fun, Games, Line Drawing. Page viewed 3376 times, 1 so far today. Need help on using these apps? Please read the Help Page.